Most French students know that French has several forms for you: “tu” and “vous”. If knowing which one to use when meeting a French person is not always easy, it’s even harder to decide when it’s time to switch from “vous” to “tu”, and how to do the transition smoothly. As you know if you have studied with my Greetings and Politeness audio lesson, the choice between “tu” and “vous” to translate ‘you’ in French is not an easy one. First, it’s a question of ‘number’ = are you talking to several people? In that case, you’d use “vous” for sure. No need to guess here. But when you are talking to one person (so a singular you) you’ll have to choose between “vous” and “tu”. I could write pages on the subject of “tu” versus “vous” in French. 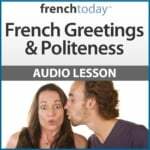 The cultural differences as well as the grammar and specific vocabulary are all explained in depth, with many examples, in French Today’s audio lesson about Greetings and Politeness, which I encourage you to check out. Unless there is a large age difference, when someone says “tu” to you, you can “tu” him/her back. They are often used in the reflexive form : se tutoyer, se vouvoyer. Now, the thing students of French don’t always realize is that the choice between “tu” and “vous” is not a fixed one. You can start with “vous”, and then move to “tu” as your level of friendship evolves, as you grow older, or should the context get less formal. The switch is going to go from “vous” to “tu”. Going from “tu” to “vous” is extremely unlikely: once you say “tu” to someone, this person stays “tu”. 5 – Does all “Vous” Eventually Become “Tu”? Nowadays, with time, most non-business relationships would eventually move from a “vous” to a “tu” status. It was not so before, when higher social classes would stick with “vous”, even among friends and sometimes even family members. But now, only an important age difference may call for one person using “vous” (the younger one) and the other using “tu” (the older one). Other differences (gender, social class) would be considered quite old-fashioned or even snobbish. The thing is when one person offers to say “tu”, it’s extremely impolite to refuse. Like someone offering his friendship and you saying: “no thanks, I’d rather keep things formal between us”. So, a positive answer is very much expected, and the contrary would be extremely surprising, rude even. Yet, a French person would know better than to venture asking to switch to “tu” when it was not appropriate to do so… This may prove much harder for a foreigner! 7 – Who Initiate Transitioning From “Vous” to “Tu”? if there is a big age difference (say 20 years minimum), it’s the older person who should initiate the switch from “vous” to “tu”. if the relation involves a man and a woman, it’s up to the woman to transition from “vous” to “tu”. If it’s an older man and a younger woman, it’s complicated. That’s where you should play it by ear… It often boils down to a simple thing: could there be any romantic interest between the two person involved? If yes, it’s the woman who chooses between “tu” and “vous”. If not, age is the determining factor. When the two people have the same age and are the same gender, then there is no rule on who should break into using “tu”. So now, let’s see some typical sentences actually used to switch from “vous” to “tu” in French. Asking to switch from “vous” to “tu” is actually a pretty formal act on its own (and not so useful since I just said you can expect a positive answer). On devrait se tutoyer maintenant, non ? We should use tu now, don’t you think? Tu veux bien qu’on se tutoie, n’est-ce pas ? You’re OK with us using “tu”, right? On peut se tutoyer ? Can we use “tu” between us? Allez, on se tutoie ! Come on: let’s use “tu”! Je t’en prie, tu peux me tutoyer ! Leyla, tu dois dire “vous” à cette dame. Comment est-ce que je dois m’adresser à ta mère ? Je la vouvoie ou je la tutoie ? How should I address your mom? Should I use “vous” or “tu”? 9 – What Should You do if the French Person Keeps Using “Vous”? You need to be subtle about this and see if this is just a question of time needed to break from an old habit (some people just have a harder time using “tu”, often because of their familial education), or if the person is smoothly trying to make a point. Then adapt accordingly. For example, a woman can use “vous” to discreetly keep some distance between her and a man. A work colleague may want to keep the relationship strictly business. Someone from a higher social class may not want to break into the “tu” with someone who is of lower social class (in this case it’s quite snobbish). The best way to really understand the subtleties of the French yous is to get many examples, and see in what context they are used. To learn French in context, check out French Today’s downloadable French audiobooks: French Today’s bilingual novels are recorded at different speeds and enunciation, and focus on today’s modern glided pronunciation. You’ll find exclusive mini lessons, tips, pictures and more daily on French Today’s Facebook, Twitter and Pinterest pages – so join me there!